"Excellent service & advice, timely & spot on"
Awdry Bailey & Douglas were proud to once again be title sponsors of the Chippenham Business Awards, which took place on Thursday 22nd February 2018 at the Neeld, Chippenham. TV presenter Marc Allum, best known for his regular appearances on the BBC Antiques Roadshow, returned to host the awards which were attended by 150 finalists, sponsors and members of the business community. This was the second business awards organised by Chippenham Business Improvement District (Chippenham BID). Tom Paget, Commercial Solicitor at Awdry Bailey & Douglas and manager of the firm's Chippenham office, is a director of Chippenham BID and is chair of the Backing Business committee which organised the awards. Tom was joined on the night by Senior Partner Alexander David and guests for what was a fantastic evening celebrating the success of the Chippenham business community. 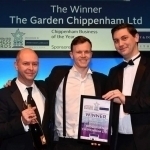 Independent Business of the Year: J. Sheppard and Son Ltd.
Congratulations to all of the winners, but in particular to the Garden Chippenham as overall winners of the Chippenham Business of the Year award. Our thanks to all those that took part by organising, sponsoring or entering an award for making this such a successful evening. These articles are provided for general interest and information only. They do not constitute legal advice. Whilst every effort is made to ensure that the content accurately reflects the law in England as at the date of preparation, no liability is accepted for any loss or damage arising from any act or omission resulting from any information contained herein.